Hints of rosemary, soy and maple create a balanced and complex flavor profile for this perfectly healthy and easy dish! 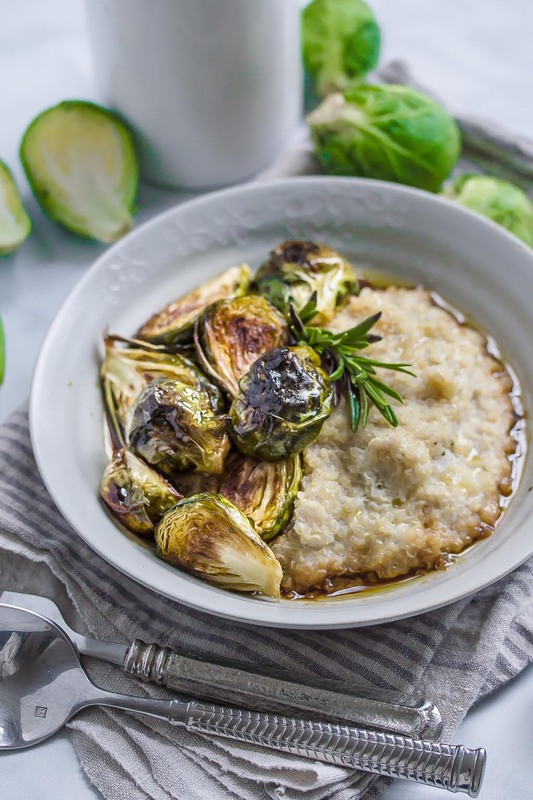 Simple roasted Brussels sprouts with a 3 ingredient glaze complements a risotto made from healthy, organic quinoa. This dish would be perfect with a simple green salad of some baked tempeh or tofu. I also enjoyed it alone for a quick lunch! I love this technique for making vegan risotto, which van be applied to many different grains. I’ve used it with brown rice, farro, and barley. The secret is in the cashew milk, which thickens very quickly and easily when cooked. The cashew milk gets added at the end, after the grains have been cooked. Keep stirring it after the cashew milk has been added to keep it from burning on the bottom of the pan, and make sure you are cooking it on the very lowest flame possible at this point. high in protein and one of the few plant foods that contain all nine essential amino acids. high in fiber, magnesium, B vitamins, iron, potassium, calcium, phosphorus, vitamin E and various beneficial antioxidants. 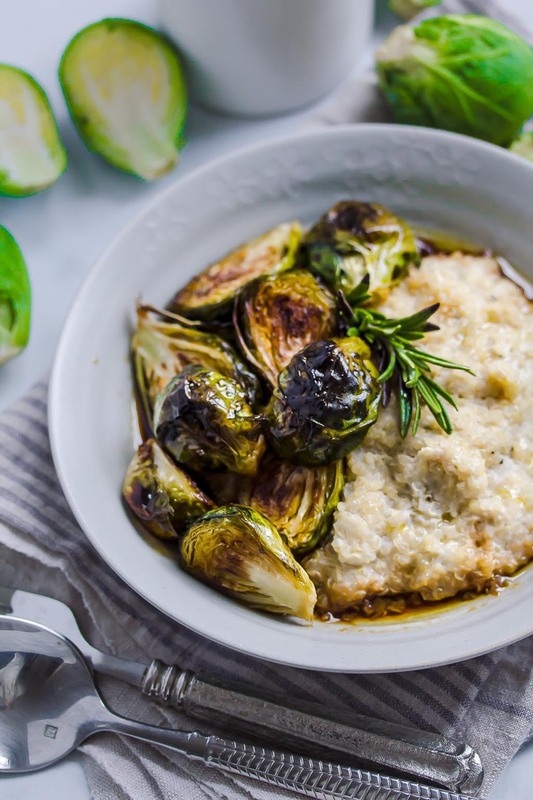 Sweet and savory roasted Brussels sprouts served over creamy quinoa risotto makes a quick and easy lunch or dinner, served with a salad! In a medium sauce pan, heat the olive oil over low heat. Add the onion and garlic, and sauce for 2-3 minutes over low heat. Add the water and bring to a simmer, then add the quinoa. Cover and cook for 15-20 minutes, or until all the water is absorbed. After the water is absorbed, add the cashew milk and stir. Continue to stir the quinoa over very low heat to prevent the risotto from burning. When the mixture has thickened (about 3-5 minutes), turn off the heat and set aside until ready to serve. For the Brussels sprouts, preheat the oven to 400 F. Wash the Brussels sprouts and cut in half lengthwise, Transfer to a small mixing bowl and toss in the olive oil. Place on a baking sheet cut side down and roast for 10 minutes. Remove from the oven and flip the Brussels sprouts and roast on the other side for 5-10 more minutes depending on how well cooked you like them! Remove from the oven and transfer the cooked Brussels sprouts to a bowl and dress with the maple syrup and tamari. Serve immediately on top of the risotto, garnished with a rosemary sprig.